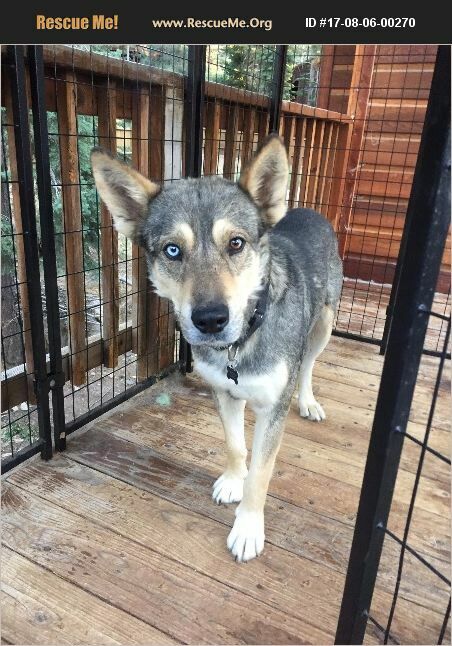 Timber is an approximately 2 years old husky/shepherd mix who was rescued from Tonopah, NV (Thanks to our friends at Res-Que) where he was running with a pack of dogs most likely his whole life. Fairly certain he hasn't had any human interaction until coming to stay at THR. He has been at the rescue for a little over four months now and is still wary of us, however he's very active and energetic with us. Petting him is a sneaky process and really only done on his terms. Timber is a very happy dog who barks and wags his tail when he sees us pull in the driveway but even more so when it's time for food. He LOVES food and feeding time. Timmy is a vocal guy who says 'good morning' every day and always tries to get in the mix with the other dogs. He's timid and still unsure of people but at no point has ever shown any aggression towards people or other animals. He does seem to feel a little more comfortable with women over men. If you have ever rehabbed a dog before, the transformations they make can be truly amazing! Anyone who is interested in him must know that gaining his trust will take TIME and PATIENCE! This can be a lengthy process so your commitment is crucial to his success. Timber would probably be the happiest on a large ranch or with someone who has acreage where he can run and explore but know where his food comes from. He absolutely loves to be outside! A home where he can keep watch and alert you to anything outside would be his ideal job. Please no younger kids with this guy and a secure fence/yard is a must. If you have any questions, please contact us. Serious inquiries only. He will need someone who is dedicated to his social development and well-being so we ask for experienced adopters for this guy. Timber's rehabilitation is at minimum a year, if not more, and adopting him is a life long commitment.